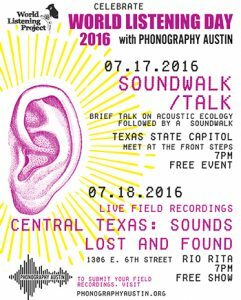 On Monday, July 18, 2016 at 7:00 PM, the public is invited to attend the presentation of field recordings related to either the theme of Sounds Lost and Found, or to the sounds of the Central Texas region, at Rio Rita, 1308 E. 6th, Austin, Texas. World Listening Day is an annual global event held on July 18 to celebrate the listening practices of the world and the ecology of its acoustic environments, raise awareness about the growing number of individual and group efforts that creatively explore acoustic ecology, and design and implement educational initiatives that explore these concepts and practices. 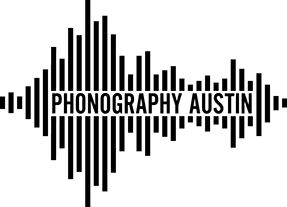 World Listening Day 2016’s theme, Sounds Lost and Found, calls on reminiscing, listening and observing what changes in our soundscapes have occurred in recent decades—be it language, nature, technology, music or even silence itself.